MOT Test and car servicing a good combination? Unlike an MOT test, servicing is not a legal requirement for your vehicle. However, you will probably find that regular servicing can help to keep everything. Sometimes I find it a great shame that we in the motor trade have to keep harping on about car menu servicing your cars. One of the biggest spoilers in recent times has been the recession. Car drivers just haven’t had any spare cash to spend on the vehicle. We have all seen people just putting £10’s worth of fuel into their cars at the filling station? car without a valid MOT test certificate is an offense reference section 47 of the 1988 Road Traffic Act. Also driving without an MOT test will make your insurance invalid and you may receive a fine of up to £1000. Is it really worth it, when you can have an MOT test and a service for most average family saloons for around £150? If you are not sure where you can go for your vehicle serviced you should go online and look for your nearest Unipart Car Care Centre (UCCC), they will offer you excellent service at a fair price. Once you have had your MOT test and service you should be safer for another year, although I recommend that you have an engine oil and filter change in between the tests to be on the safe side. Also do not forget check your levels at regular periods, say once a week and top them up when required. Here we are now at the back end of 2014, nearing Christmas time and the price of fuel has plummeted. The only problem is that the price of oil and petrol is not following as fast. The experts say that it may take a little longer for this to take place, but i was just wondering if services on cars wold be also coming down. I am not so sure , but i suspect so. Pellon Tyre and Auto-centre offer car and van services and repairs to all makes of vehicles. We are members of Unipart Car Care centres and give a nationwide guarantee for all our work and parts. 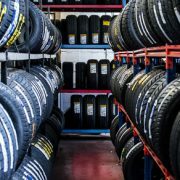 We also sell Uniroyal Car Tyres online from our website www.pellonautocentre.com by using the tyre selector and choosing your tyre size. We offer courtesy cars to local motorists who need to go to work and leave their car with us for work doing. We are also an official MOT testing station and are members of Motor-codes, who carry out checks for high standard of equipment and workmanship. Solar Storage Batteries-Understanding our future storage Needs? Michelin EV Tyres-TYRE TALK-Twitter / Michelin Tyres: Here’s a first look... Winter Tyres Safety-One Of The Best Safety Items You Could Add To Your Car.